The surface of a toxic ocean. Toxic is a primary biome type characterized by a vast expanse of poison ocean with small scattered islands made of mud, raw sewage and waste. Traversing the surface is best done with boats rather than swimming because coming in contact with the poison will apply poisoned to the player. This can be counteracted using antidote. The ocean floor is covered with plant life, pipes and glowing waste. Toxic planets are a 'dangerous' threat level, geared toward tier 4 in progression. Toxic planets can be found orbiting radioactive (yellow), frozen (blue) and fiery (red) star types. Unless players have a Radiation EPP Upgrade equipped they'll perpetually take damage from deadly radiation while on the planet. The poison ocean found on toxic planets is infinite, and cannot be drained. All air below surface level is replaced with poison. To build underwater and not have poison spawn inside your structure, you must replace the background and foreground with blocks, then remove the foreground blocks and poison will stop spawning. Agrobats, Crutters, Miasmop, Oculobs, Pteropods, Snagglers, Snaunts, and Squeems all have a chance of being found in toxic biomes. This planet is toxic - the air is putrefied and the oceans are poisonous. Radiation exceeds safe levels by a factor of thousands. This highly radioactive planet is a poisonous wilderness inhabited by irradiated lifeforms. It's luminescent surface is toxic. An uninviting destination. This is a toxic planet replete with radiation. The noxious oceans are lethally poisonous... May I remind you that other destinations are available. The surface layer of toxic planets is primarily made up of poison ocean with small scattered islands made from mud, raw sewage, rusty blocks and waste. Commonly these islands have trees which can be harvested for a plant fibre and toxic waste. Toxic planets are mostly covered in poison which spawns endlessly. There's no way to gather all of the poison found in toxic oceans. Ores can be found on surface islands, with of copper, silver ore, gold, titanium and durasteel available in small quantities. Most ore is accessible beneath the poison ocean floor. Toxic surface biomes use their own sets of music tracks for day and night. Toxic ocean floor biomes use the Day Tracks plus both Arctic Exploration tracks during the day and the Night Tracks during the night. Toxic planets do not have any sub biomes which appear, and toxic oceans do not appear as a sub biome on any other planet types. There are no mini-biomes found on the surface or underwater in toxic biomes. Toxic planets deviate somewhat from planetary standards due to being ocean-type planets. There are only two harvestable crops found on toxic planets: Toxictop and Kelp. Toxictops can be harvested by interacting with them or by digging them up, but Kelp must be felled like a tree before it can be collected. Toxictop plants drop toxictop and have a chance to drop a seed which can be replanted. Toxictop is found only on the islands in the poison ocean while kelp is found only on the floor of the poison ocean. The trees on toxic planets can be harvested for plant fibre and toxic waste, but do not drop seedlings so they cannot be replanted. Unlike Kelp on Ocean planets, Kelp on toxic planets drops saplings which can be planted to grow more kelp. In addition to procedurally generated creatures, there are a variety of unique monsters, bugs and critters found in toxic biomes. Some of these are also found in other biomes, while others are unique only to toxic biomes. While these unique creatures have a chance to appear on toxic planets, they will not all appear on each one. In addition to unique creatures, each biome has multiple types of both procedural ground and flying creatures. There are a number of fish which can only be caught on toxic planets using a Durable Fishing Rod. These fish won't be seen swimming in the wild without a fishing lure to attract them. A basic fishing rod will not work on toxic planets. There are a variety of items which are specific to chests found in toxic biomes. Some of these may have a chance of being found in other places throughout the universe, but they've all been specifically allocated to toxic chests within toxic biomes. Furniture crafted from toxic blueprints is tagged with the object tag toxic. There are no tenants associated with the toxic object tag. 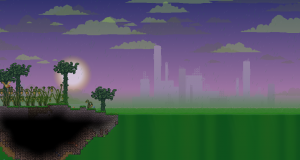 The toxic biome parallax shows ruins of old structures, none of which remain. There are no villages or dungeons found on toxic planets - they're too harsh to support any type of settlements. Explosive Barrel Decorative 55 An explosive metal barrel. It looks dangerous. Girder Block 0 A strong looking metal girder. Heavy Iron Bars Block 0 Thick iron bars. Still strong, though decaying with rust. Heavy Pipe Block 0 A heavy pipe, commonly used in waste systems. Metal Support Beam Decorative 60 A support beam painted with cautionary stripes. Mind your head! Mining Railing Decorative 50 A metal fence with red and black warning stripes. Modern Platform Platform 0 Made from a modern material, this platform is smooth to the touch. Outpost Support Beam Block 0 A reinforced support beam. Packed Bones Block 0 A collection of bones tightly packed together. Radioactive Barrel Breakable 55 A barrel full of radioactive material. Short Chain-link Fence Decorative 80 It's a chain-link fence. Toxic Chest Storage 70 A toxic chest. Wires Decorative 60 This is just an electrical fire waiting to happen.